Please note: There is no 3x3x3 Cube being held at this competition! The main event of this competition is Megaminx. You are welcome to come to this if it is your first competition, but note that many of the usual events will not be held. Koalafication Perth 2019 in May will have the 'fast' events. The base registration fee for this competition is $12 (Australian Dollar). Upon registering you will receive an email stating “Your registration for Slow Down Perth 2019 is submitted and pending approval” Please ensure you have paid the registration fees via stripe on the register page. Your registration will not be processed until you have paid the registration fee. Once the competitor limit has filled new registrations will be added to a waitlist to be sorted in the order of payment. Waitlisted competitors will only be accepted provided one of the accepted competitors withdraws from the competition by emailing the organisation team at support@speedcubing.org.au. All competitors still on the waiting list after the 17th of April will be removed. To receive a refund you must email the organisational team at support@speedcubing.org.au before the 17th of April. Refunds will not be issued after this date for any reason. You are viewing the schedule for the venue The University of Western Australia. The schedule is displayed in the timezone Australia/Perth. If you are competing in 3x3x3 Fewest Moves please aim to arrive at 8:20 so we can begin on time. In general you should be at the venue ready to compete 20 minutes before the scheduled start of your event. Please note the schedule is subject to change on the day. If you are participating in 3x3x3 Multi-Blind you must submit your cubes by 9 am (unless you are also competing in 3x3x3 Fewest Moves in which case you must submit them before 8:30). Q. Will I be able to compete in 3x3x3 Cube and other typical events? NO! This competition involves traditionally "slow" events that are not held frequently (or have never been held) in Perth. If you want to compete in typical events such as 3x3x3, 2x2x2, Pyraminx, etc. we suggest you look at Koalafication Perth 2019 in May. Of course if you like 3x3x3 fewest moves, 6x6x6, 7x7x7, Megaminx, Clock or "big blind" events then this is the competition for you and we can't wait to see you there!. Anyone can compete at any age! We encourage anyone considering to compete to register as it will be a great experience regardless of age. Please note however that this competition does not include the typical events we run at a Perth competiton. Your Delegate for this competition is Edward Hollingdale. Of course! Throughout the day we will need judges and runners so please see the organisers to ask how you can best assist. 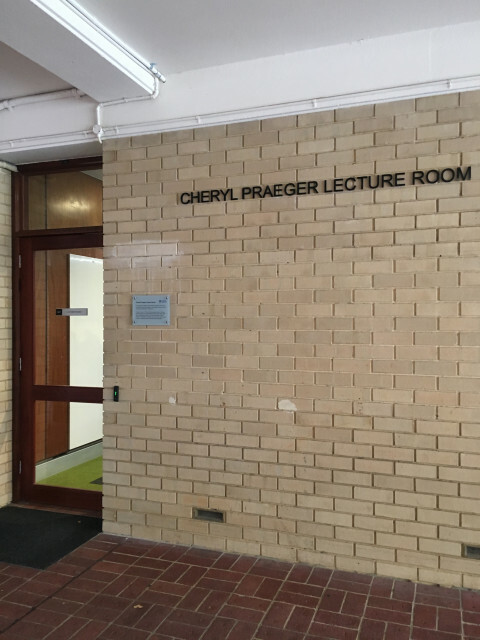 Our venue is the Cheryl Praeger Lecture Room in the UWA School of Mathematics and Statistics building. This is next door to the venue for Perth Winter 2017. As Easter Monday is a public holiday there will be plenty of free parking at UWA, either off Fairway or next to Reid Library. 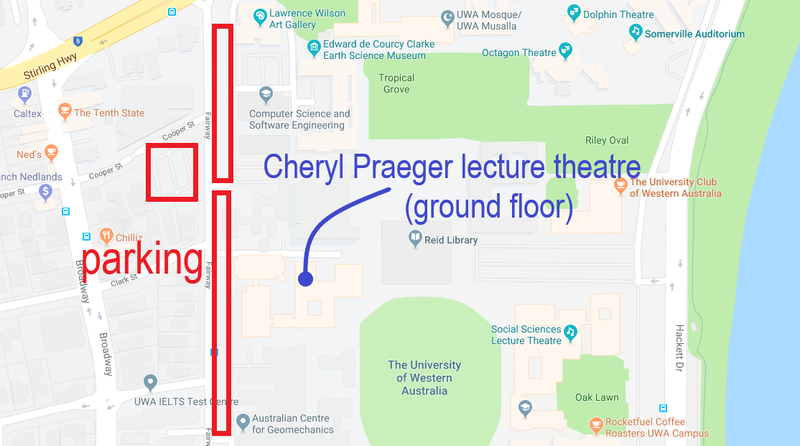 Once you are at UWA, the lecture room is off to the side of the courtyard between Weatherburn Lecture Theatre and the Monadelphous Integrated Learning Centre.